Bottled from the Last Consignment of stock of Royal Naval Rum, which had been hidden in storage since Black Tot Day in 1970 - when the official rations ceased - Black Tot is a true piece of rum (and naval) history. Rumfest Golden Rum Barrel Awards 2010: Best European Rum. 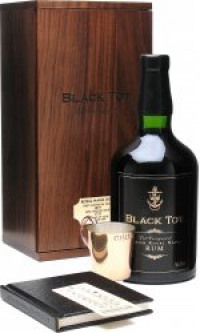 The name 'Black Tot' stems from July 31st 1970 when a 300 year-old Royal Naval tradition ended at precisely 6 bells in the forenoon watch (11am) when the last rum ration was issued aboard ships of the British Royal Navy - a day to be forever remembered as Black Tot Day. Forty years on, the last remaining Royal Naval rum stocks from 1970 are being sold. This last consignment of the original rum has been bottled from the original imperial gallon stone flagons into which it had been filled and sealed under HM Customs & Excise supervision in December 1970. Black Tot - Last Consignment rum was officially released on the 31st July 2010 to celebrate the 40th Anniversary of Black Tot Day. This unique rum represents the last fragment of a Naval tradition that began in 1655 and ended forty years ago, and as such, can be considered an important landmark in naval history, and the history of rum itself. Tasting Notes by Dave Broom... The Colour - Bright, yet deep mahogany cut with flashes of ruby. The Nose - Initial treacle notes precede dark chocolate with super-ripe black fruits, muscovado sugar adn walnuts. A drop of water releases notes of black banana, liquorice root, tamarind paste with and exotic edge of balsamic. The Palate - Starts off thick and sweet, becoming light and oaky before a burst of cassis / creme de mures then espresso & cacao. The Finish - Very long with light scented wood, black fruits and cigar tobacco. The Strength - Remarkably, after 40 years Black Tot will be introduced at 54.3% (94.2° proof), almost exactly original issuing strength.